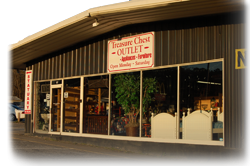 Treasure Chest Outlet is a family-friendly, Christian environment where you can find quality used furniture, appliances, housewares, outdoor statuary, decorations and other hidden treasures at give away prices. Plus, we carry an inventory of brand new furniture at prices you won't believe. Come on by and check us out!